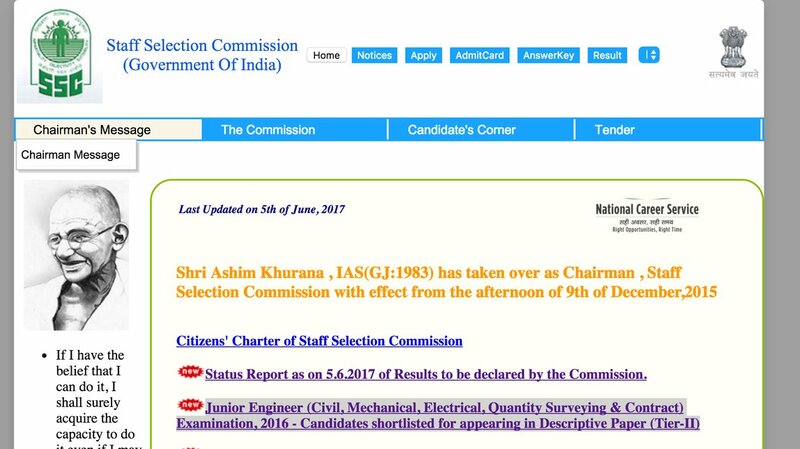 The Staff Selection Commission (SSC) has released the results for the Junior Engineer (Civil, Mechanical, Electrical, Quality Surveying & Contract) Tier I examination 2016. The examination took place from March 1 to 4, 2017 at different test centres across the country. Candidates will be able to check their results on the official website. The results, which were supposed to be out on June 7, was preponed by the commission and was declared on June 5. Candidates selected in the Tier I SSC JE examination will have to appear for the Descriptive Test (Tier II) for further selection. A total of 3,39,379 candidates took part in the SSC JE Tier I examination, of which 1,33,983 chose Civil, 1,15,075 Mechanical and 90,321 chose Electrical streams. Along with the list of 5,892 selected candidates for Civil Engineering and 2,440 for Electrical/Mechanical Engineering for the Descriptive Round (Tier II), the commission has also released the cut off for different streams. With the most number of students opting for it Civil Engineering, the cut off has been set to 100, while for Electrical/Mechanical Engineering stream, it is 115 for General Category students. With 92.50 marks, 2,725 OBC candidates have been selected for Civil Engineering. On clicking the active link, candidates will be directed to a page where active links for both the streams will be present. On clicking the result section, candidates will be directed to the PDF files for Civil Engineering and Electrical/Mechanical Engineering. Candidates can save and take a print out of the results for future reference.